The last of 196 giant wind turbines dotting the San Patricio County countryside became operational and started cranking out electric power in late 2010 and have been put to work meeting exceptionally high peak power demands this winter. E.ON Climate & Renewables North America, Inc. has completed construction of Phase II of the Papalote Creek Wind Farm, adding 87 turbines to the 109 that went into service in 2009. Additional turbines may be added to the wind farm in the future. 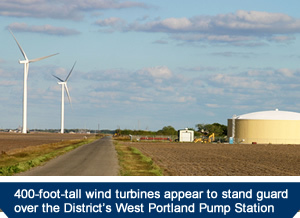 The new turbines reach to a peak height of 398 feet above the surrounding cotton and grain crop land. 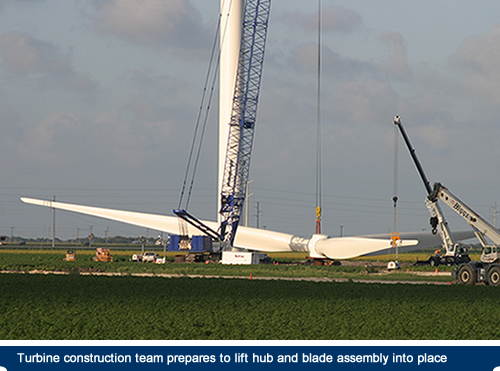 Each blade assembly has a diameter of 333 feet and sweeps a space bigger than the area of a football field. The Siemens turbines each have a maximum rated capacity of 2.3 megawatts when the wind is blowing sustained at 34 mph or more. The turning speed of each turbine is controlled by blade pitch. 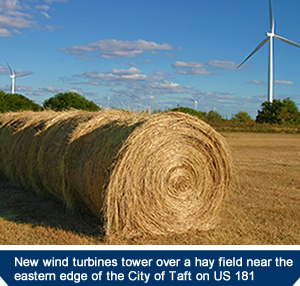 Turbines operate in a range of 6 to 16 RPMs with a maximum blade tip speed of 169 mph. Units of the wind farm dot thousands of acres of farm land in an irregular 16-mile long crescent stretching from near Odem to Taft and Portland and then to a point several miles north of Gregory – all communities that are served by the San Patricio Municipal Water District. The power generated by Phase 1 of the project is being sold under long-term contract to CPS Energy, San Antonio’s city-owned electricity provider. All of the power generated from Phase II is being sold under contract to the Lower Colorado River Authority, electricity provider for much of Central Texas. Together the 196 turbines can crank out about 380 megawatts of power when the wind is blowing – which is most of the time in San Patricio County. That is enough power to serve approximately 115,000 homes. Power from the Papalote Creek Wind Farm is prized over power coming from some West Texas wind projects because the winds are strongest along the South Texas coast most often during the daytime when demand for power is the highest. The wind farm has added more than $500 million in value to the property tax base of San Patricio County and local school districts. County commissioners granted E.ON a multi-year tax abatement agreement. E.ON took on the task of upgrading more than 20 miles of county roads as part of the agreement.